Majorities in Pakistan, the Palestinian territories, Mexico and China itself also foresee China supplanting the U.S. as the world’s dominant power. In most countries for which there are trends, the view that China will overtake the U.S. has increased substantially over the past two years, including by 10 or more percentage points in Spain, France, Pakistan, Britain, Jordan, Israel, Poland and Germany. Among Americans, the percentage saying that China will eventually overshadow or has already overshadowed the U.S. has increased from 33% in 2009 to 46% in 2011. At least some of this changed view of the global balance of power may reflect the fact that the U.S. is increasingly seen as trailing China economically. This is especially the case in Western Europe, where the percentage naming China as the top economic power has increased by double digits in Spain, Germany, Britain and France since 2009. 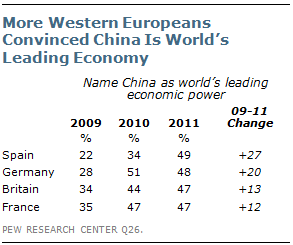 In other parts of the globe, fewer are convinced that China is the world’s leading economic power. Majorities or pluralities in Eastern Europe, Asia, and Latin America still name the U.S. as the world’s dominant economic power. In the Middle East, Palestinians and Israelis agree that America continues to sit atop the global economy, while in Jordan and Lebanon more see China in this role. Notably, by an almost 2-to-1 margin the Chinese still believe the U.S. is the world’s dominant economic power. These are among the key findings from a survey by the Pew Research Center’s Global Attitudes Project, conducted March 18 to May 15.1 The survey also finds that, in the U.S., France, Germany, Spain and Japan, those who see China as the world’s leading economic power believe this is a bad thing. By contrast, those who name the U.S. tend to think it is good that America is still the top global economy. In developing countries those who believe China has already overtaken the U.S. economically generally view this as a positive development. Meanwhile, in China, those who believe the U.S. is still the world’s leading economy tend to see this as a negative. Compared with reaction to China’s economic rise, global opinion is more consistently negative when it comes to the prospect of China equaling the U.S. militarily. Besides the Chinese themselves, only in Pakistan, Jordan, the Palestinian territories and Kenya do majorities see an upside to China matching the U.S. in terms of military power. Meanwhile, the prevailing view in Japan and India is that it would not be in their country’s interest if China were to equal the U.S. militarily; majorities across Western and Eastern Europe, and in Turkey and Israel, share this view. France, Spain, Germany and Britain rate the U.S. positively. 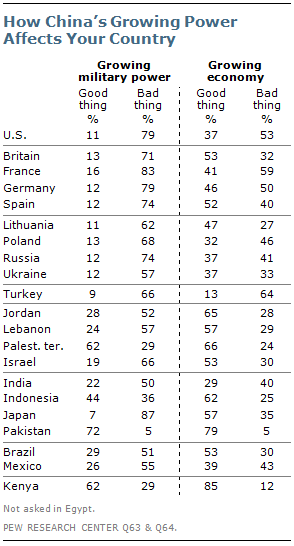 Opinion of the U.S. is also consistently favorable across Eastern Europe, as well as in Japan, Kenya, Israel, Brazil and Mexico. As in years past, U.S. image continues to suffer among predominantly Muslim countries, with the exception of Indonesia, where a majority expresses positive views of the U.S. One-in-five or fewer in Egypt, the Palestinian territories, Jordan, Pakistan and Turkey view America favorably. In Lebanon, opinion of the U.S. is split, reflecting a religious and sectarian divide; the country’s Shia community has overwhelmingly negative views of America, while Lebanese Sunnis and Christians are more positive. In Western Europe, fewer than half in Britain (40%), France (32%) and Spain (19%) say the U.S. takes the interests of other countries into account when making foreign policy decisions. Only in Germany does a majority feel otherwise. In Eastern Europe, a third or less believe America acts multilaterally. Interestingly, a majority of Chinese (57%) credit America with considering the interests of other nations, although last year more (76%) held this view. Elsewhere, majorities in Israel, India, Japan, Brazil and Kenya describe the U.S. as multilateral in its approach to foreign policy. Majorities or pluralities in nearly every country surveyed say the U.S. and NATO should remove their troops from Afghanistan as soon as possible; the only exceptions are Spain, Israel, India, Japan and Kenya, where more say troops should remain in that country until the situation is stabilized than say they should be removed. However, in many parts of the world, there is strong support for the broader, American-led effort to combat terrorism. About seven-in-ten in France (71%), two-thirds in Germany, 59% in Britain and 58% in Spain back U.S. anti-terrorism efforts. 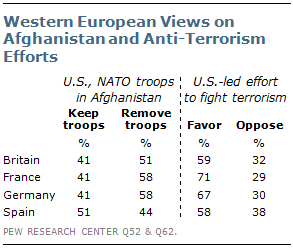 Majorities in Eastern Europe also support the U.S.-led fight against terrorism, as do most in Israel and Kenya. Across the nations surveyed, the U.S. generally receives more favorable marks than China: the median percentage rating China favorably is 52%, eight points lower than the median percentage offering a positive assessment of the U.S. However, the number of people expressing positive views of China has grown in a number of countries, including the four Western European countries surveyed. China’s image has also improved in Indonesia, Japan, Egypt and Poland. Opinion of China has worsened substantially in only two countries surveyed: Kenya (down 15 percentage points from last year) and Jordan (9 points lower than in 2010). U.S. image, meanwhile, has declined in most countries for which there are trends. 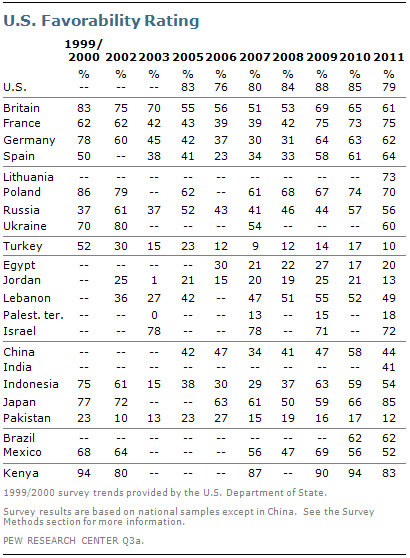 Compared with last year, favorable views of America are lower in Kenya (11 percentage points), Jordan (8 points), Turkey (7 points), Indonesia (5 points), Pakistan (5 points), Mexico (4 points), Poland (4 points) and Britain (4 points). However, the largest downward shift has occurred in China, where the number expressing a positive view of the U.S. has fallen 14 points – from 58% in 2010 to 44% today. Assessments of President Obama track fairly closely with overall U.S. ratings. Obama is viewed most positively in Western Europe, where solid majorities say they have confidence in the U.S. president to do the right thing when it comes to world affairs. At least two-thirds in Kenya, Japan and Lithuania also express confidence in Obama, as do smaller majorities in Brazil, Indonesia and Poland. As is the case with the overall U.S. image, Obama receives his most negative ratings among predominantly Muslim countries. In the Arab world, majorities in the Palestinian territories (84%), Jordan (68%), Egypt (64%) and Lebanon (57%) lack confidence in the president. Roughly seven-in-ten in Turkey (73%) and Pakistan (68%) say the same. Indonesians are the exception, with 62% saying they have confidence in Obama to do the right thing in world affairs. Overall, the U.S. president continues to inspire more confidence than any of the other world leaders tested in the survey. German Chancellor Angela Merkel is next most trusted, at least in Europe and Israel. Majorities across Western Europe endorse the German leader’s handling of world affairs, as do most in Eastern Europe. In fact, in Russia and Ukraine she is more trusted than Obama; this is also the case in Israel. Broad trust in Obama’s leadership does not mean foreign publics necessarily agree with the U.S. president’s policies. For example, in nearly every nation surveyed majorities or pluralities disapprove of Obama’s handling of the Israeli-Palestinian conflict. Many also disapprove of Obama’s handling of Iran and Afghanistan, while reactions to the way he has dealt with the recent calls for political change in the Middle East are mixed. In general, Obama receives his highest marks for his handling of global economic problems. Majorities across Western Europe, for example, endorse Obama’s approach to economic issues, with the highest approval (68%) found in Germany. Large numbers in Kenya, Japan, Indonesia, Brazil and Lithuania also approve of how the U.S. president is dealing with the challenges facing the global economy. Across the globe, public reactions to China’s growing economy are far more positive than opinions about the country’s growing military power. Positive assessments of China’s growing economy are most widespread in the Middle East, where majorities in the Arab countries surveyed, as well as Israel, agree that China’s economic growth benefits their country. Most in Kenya, Pakistan, Indonesia, Japan, Britain, Brazil and Spain also say China’s growing economy is good for their country. Within Asia, only Indians offer negative views, with just 29% describing an expanding Chinese economy as a good thing and 40% saying it is a bad thing for their country. When China’s emerging power is framed in military terms, publics in most surveyed nations react less favorably. Majorities or pluralities in all but four of the nations surveyed say China’s increasing military might is a bad thing for their country. This is especially the case in Japan, the U.S., Western Europe and Russia, where at least seven-in-ten have negative views of China’s growing military power. In contrast, about seven-in-ten Pakistanis (72%) see China’s growing military might as a good thing for their country, as do 62% of Kenyans and Palestinians. Indonesians, by a slim margin (44% to 36%), concur with this view. Opinions as to whether the U.S. or China is the world’s leading economic power, and whether China will supplant America as the dominant superpower, are taking shape against a backdrop of widespread uncertainty about the future and unhappiness with economic conditions at home. In most of the nations surveyed, people say their country’s economy is in bad shape and express dissatisfaction with the way things are going in their country. Moreover, few expect economic conditions to improve in the next year. Frustration is especially intense in Pakistan, where roughly nine-in-ten say they are displeased with the way things are going in their country, but large majorities across the globe are also dissatisfied. For example, in Spain, dissatisfaction with the country’s direction is at its highest level (83%) since 2003. Meanwhile, the number of Americans who think their country is headed in the wrong direction has swelled from 62% to 73% over the past year. In many instances, levels of overall satisfaction are linked to assessments of the economy. In the U.S., France, Britain and Spain, eight-in-ten or more offer a negative assessment of the national economy, and majorities in these countries see rising prices and a lack of jobs as very big problems. Inflation worries are especially pronounced outside the industrialized West. Overwhelming majorities in Pakistan, Kenya, Lebanon, the Palestinian territories, India and Indonesia describe price increases as a major problem. In Spain, Britain and the U.S., unemployment weighs more heavily than rising prices on the minds of average citizens. The Chinese public is the most upbeat about economic conditions, with nearly nine-in-ten describing the domestic economy as good. In Germany, two-thirds echo this view, while smaller majorities in India, Israel and Brazil favorably assess the economic situation in their country. Inflation and a lack of job opportunities are also seen as less urgent issues among Chinese and German respondents. In Germany, for instance, only about a third of the public describes either price increases or unemployment as very big problems. In China, 37% say a lack of jobs is a major concern, while about half are worried about inflation. Despite economic concerns, publics in all regions express substantial support for growing international trade and business ties with other countries. No fewer than two-thirds in each country say increased international trade is very or somewhat good for their country. Among those who describe the economic situation in their country as bad, most place the primary blame on government. To a greater degree than others, Western Europeans fault banks and other financial institutions for economic troubles at home, with as many as 75% of those who say the economy is bad in Britain and Spain taking this view. Worldwide, people tend to blame outside forces, rather than individuals themselves for unemployment in their country. In Western Europe and the U.S., roughly seven-in-ten or more attribute unemployment to forces beyond the control of individuals. The United Nations generally receives positive marks among the 23 nations surveyed. However, opinion of the international body is negative in Israel (69%), the Palestinian territories (67%), Jordan (64%) and Turkey (61%). In most predominantly Muslim countries there is widespread opposition to Iran acquiring nuclear weapons. Only in Pakistan does a majority (61%) support Iran’s nuclear ambitions, although significant numbers of Palestinians (38%) and Lebanese (34%) back Iran’s acquisition of a nuclear arsenal.